Double generation by a template can be used when creating a document in the system. For example, you use a template for generating a document. At this moment, the document is not registered yet, therefore the registration number is not inserted into the generated file. You need the registration number to be inserted into the file automatically. Let's take a look at each activity. Add a variable of a document type on the Context tab. This variable will store the final document version. 2. 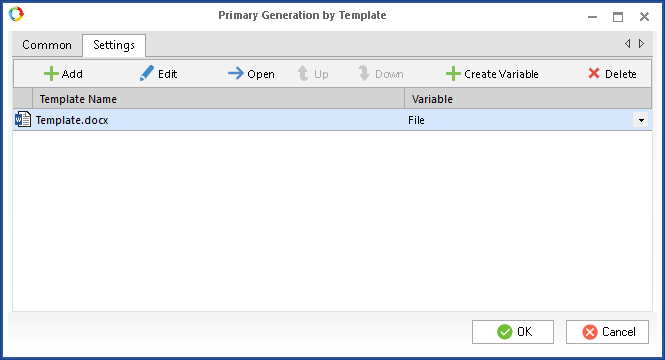 Primary Generation by Template activity. On the Settings tab, add a template and a File type variable, to which the generated document will be saved. The first braces will be expanded at the first generation, and the second - at the second generation. 3. Change Version Script activity. A script for adding a new version (File context variable) to the document (Document context variable). Before executing the script, make sure that the File and Document variables are filled in. At this stage, a registration number is created, which will be used in the template. 5. Second Generation by Template activity. The second generation is performed with a script; also, the document version is changed in this activity. The document, generated during the primary generation is used as a template. On the Context tab, add the variable of the Document type (used in the Select Document operation). The variable will display the document.